Ahead of the Memorial Weekend 2016 release of Alice Through the Looking Glass, Disney has just announced some new fun freebies to pique your interest in the upcoming movie. As you can see from this poster, Disney most definitely has a whole new look for this project. First up is this extended theatrical trailer of the upcoming adventure, family fantasy film starring Johnny Depp, Anne Hathaway, Helena Bonham Carter, Mia Wasikowska, and Sacha Baron Cohen. Also a must see for Disney fans is an entertaining behind-the-scenes featurette of artist P!nk (Alecia Moore), who will be writing and recording a new song for Alice Through the Looking Glass, in the studio talking about the film and singing the iconic song White Rabbit. 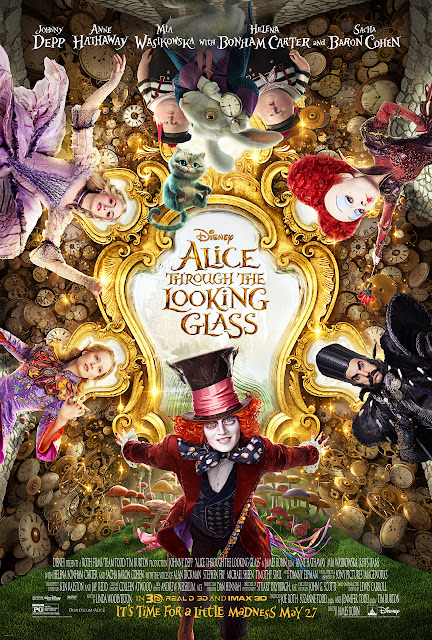 Stay up to date on all the news leading up to the release of Alice Through the Looking Glass by staying tuned for future posts right here on Mommy Blog Expert as well as following the Disney brand on Facebook, Instagram and Twitter. FTC Disclosure: I did not receive any payment or other compensation in connection with this post and Disney provided all images in this post. See complete FTC Disclosure information that appears at the bottom of MommyBlogExpert's main page and at the bottom of every individual post on this blog, including this one. I want to see this movie! Looks like it's gonna be another homerun. Love Johhy Depp. I can't wait to see this. I've been wanting to see it ever since I saw the commercial for the first time. I bet it's going to be a good movie too. As a big Johnny Depp fan, I am really looking forward to this release. I have no doubt that the sequel will be just as good as the first film! I love Johnny Depp and Pink! They are so talented. The trailer is so fun. I can't wait for the movie!!! I always enjoy Johnny Depp's quirky movies. Looking forward to seeing this one.